Pin it! 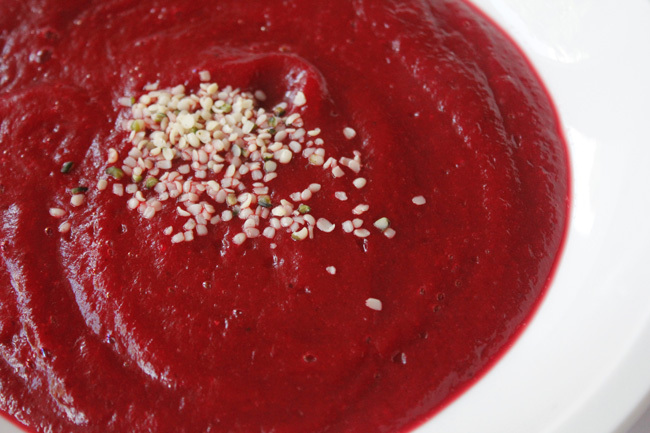 Roasted beet and butternut squash soup recipe. Roasted beet & butternut squash soup. This is the first year I've started cooking with beets, and I'm just starting to develop a taste for them. As long as the beet flavor isn't too powerful, like in beet brownies or this liver cleansing beet juice, I'm happy. The other day I made this roasted beet and butternut squash soup. It's easily customizable if you don't eat meat, too. Perfect for fall, this is a hearty yet healthy soup. Preheat the oven to 350f. Wrap the beets in aluminum foil and put in the oven for 40-45 minutes. While they're roasting, put the butternut squash in your broth of choice (side note: to make bone broth, just put bones with a little meat on them in water (chicken is really easy on the stomach, but you could also use beef) with salt and pepper, bring to a boil and then simmer for at least 2.5 hours). Bring the butternut squash to a boil, then simmer for 35-40 minutes or until you can easily pierce it with a fork. Add the seasoning and garlic in the last five minutes of cooking. Then, transfer the beets, squash and broth to a high powered blender and blend until desired consistency. Garnish with hemp seeds. Serve immediately.